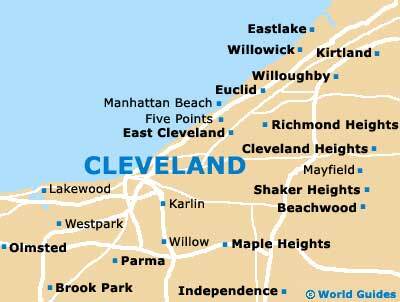 Cleveland boasts an array of captivating museums that span a range of subjects as diverse as the inhabitants of the city. 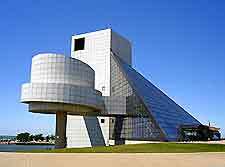 The many museums of Cleveland are spread throughout the city's neighborhoods, with a concentration of top visitor draw-cards such as the Rock and Roll Hall of Fame and its extensive rock music memorabilia, which was founded in 1995 and opened by a host of singers and musicians, including Little Richard. 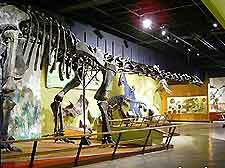 Located within the University Circle district, the Cleveland Museum of Natural History is highly suitable for families and is known for its life-size replica skeletons of Triceratops and Tyrannosaurus Rex dinosaurs, which are displayed in its Kirtland Hall of Prehistoric Life. Designed by I. M. Pei, this is without doubt one of Cleveland's most impressive museums and is worth a visit for its architectural merit alone. 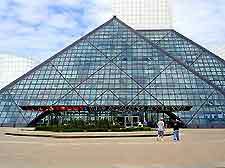 Housed in a large glass pyramid and situated on Lake Erie, this attraction has a permanent collection containing a century of iconic rock music-related artifacts. Exhibitions at the Rock and Roll Hall of Fame and Museum include the Jimi Hendrix Surround Sound Theater, Rock and Roll in the Fifties and an exhibition focused on the music of Ohio. A number of temporary exhibitions and special events take place here, while each year, the Hall of Fame hosts its annual induction ceremony, which in the past has taken place at the Waldorf Astoria Hotel in New York. This fascinating attraction exists to preserve the history of the Cleveland police force and is filled with interesting artifacts, including the first police call box and closed circuit camera. The Police Museum also contains some intriguing plaster cast death masks of murder victims and other displays focused on chilling true crimes from Cleveland's past. The curators at the Cleveland Museum of Natural History care for over four-million specimens and exhibits relating to anthropology, archaeology, astronomy, aspects of botany, geology, paleontology and wildlife biology. This attraction has some fascinating permanent collections including a prehistoric life exhibition, gem and jewel gallery and a planetarium. The Museum of Natural History is one of the city's most popular and is well worth looking out for, particularly if you are planning a visit to the adjacent Botanical Gardens or further attractions on the campus of the Cape Western Reserve University. Once a stagecoach stop on the Buffalo-Cleveland-Detroit post road, the Dunham Tavern Museum is the oldest building in Cleveland city that still stands on its original site. Set in lovely gardens, this attraction offers an insight into the history and lifestyles of early Ohio settlers and travelers, while the collections exhibited feature many American antiquities. Dedicated to the preservation of the history of women in aviation and space, the renowned International Women's Air and Space Museum showcases exhibitions documenting the contribution of women in this field from the past up to the present. Exhibitions include displays dedicated to Katherine Wright, Amelia Earhart and the role of female aviators in times of war.